The Rochester Knighthawks locked up a home playoff game, following a 13-9 win tonight over the Vancouver Stealth at the Langley Events Centre. With the win, the Knighthawks (11-5) also remained in the hunt for first place in the East Division. With two games to play, Rochester is one and half games behind the Toronto Rock. 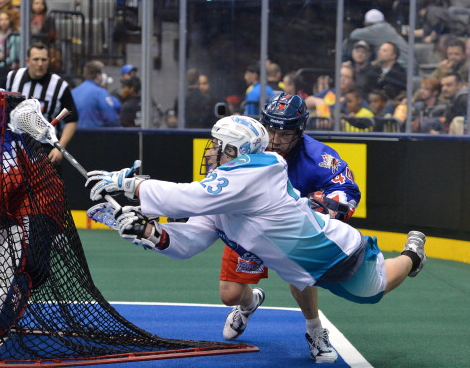 On Saturday, Jamieson (1+6) and Cory Vitarelli led the Knighthawks with seven points apiece. Vitarelli, who made his return to the lineup this weekend, scored four goals and collected three assists to reach a career-high in points in a game. He also added a goal last night in Colorado to give him eight points during the road trip. It was during the second quarter, that Rochester broke open a 2-2 game. The Knighthawks outscored the Stealth 5-2 in the second, as they received goals from five different players. Stephen Keogh got it started by scoring at 3:42 of the quarter to give the Knighthawks their first lead of the night and they never looked back. Paul Dawson scored 40 seconds later as he wired a bounce shot into the upper right-hand corner of the net for a 4-2 lead. Rochester ended the first half with goals from Jamieson and Vitarelli to move in front 7-4. Rochester opened the third with two more goals as Hall provided a highlight-reel goal, taking a Jamieson feed and firing a shot past Stealth goalie Eric Penney. Hall closed out the night with two goals and one assist in his homecoming. Hall added his second of the night midway through the fourth quarter off an assist from Dawson. His power-play tally was one of three special team’s goals for the Knighthawks, who were 3-for-5 on the man advantage. Dawson finished the game with three points (1+2), while Craig Point chipped in two points (1+1). Scott Campbell and Jon Sullivan also added single goals. The Knighthawks were backstopped by a 42-save effort from Matt Vinc.